When someone plays the role of anchor they are the one who keeps those around them grounded. It isn’t about dragging people down, it is about giving them a sense of direction when they seem to get a bit lost. The person who is the anchor is very down to earth and knows how to give people a dose of reality from time to time. For some people being the anchor is natural, while for others it is easier to find themselves with their heads in the clouds. 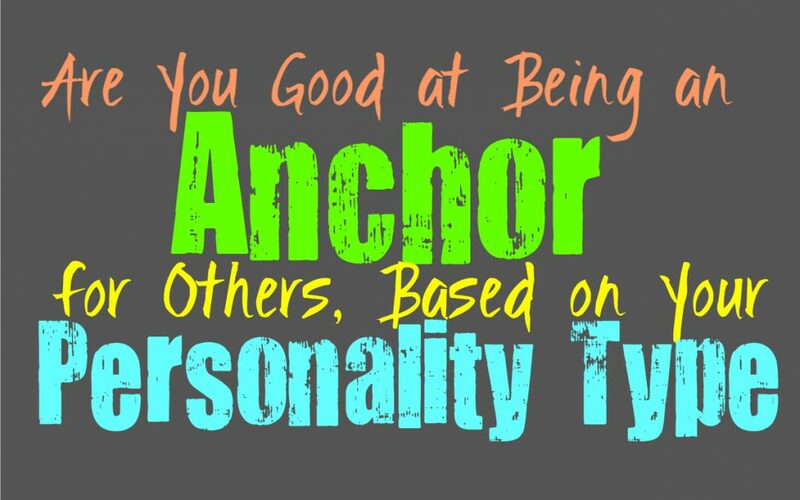 Here is how good you are at being the anchor, based on your personality type. INFJs are complex people who can be both the anchor and the one with their head in the clouds. Their minds definitely take them far away from the world sometimes, drawing them into a completely different reality. INFJs have such rich inner minds and thoughts and so they do often seem to have their minds completely distracted. While there is a side of them which can be rather dreamy, INFJs can also be grounded and practical people. Their contradicting natures often cause the INFJ to be two opposing qualities simultaneously, which is definitely confusing for most people. They are certainly capable of being the anchor when that is what people need in order to keep them from straying of course. ENFJs can be grounded people when they need to be, since they have rather versatile personalities. They are capable of providing whatever they need to for their loved ones in any given situation. While deep down ENFJs can be rather dreamy people with their heads in the clouds, they are capable of being grounded as well. They can sometimes have qualities which seem to contradict themselves, but in truth it just means ENFJs adapt to their situation. When they need to be the anchor which holds their loved ones down in the best possible way, they will provide this sense of reality and clarity for them. INFPs are rarely the anchors of their group, instead they are often the ones how need to be pulled back. They often have their heads in the clouds and might have a hard time coming down. INFPs have rich inner minds and rather in depth imaginations, which can make it difficult for them to really be grounded. Sometimes they find themselves getting lost in their own thoughts and this can drag them far away from the real world. Because of their rich inner minds they sometimes need their loved ones to rein them in, just a bit. In truth ENFPs aren’t often the ones capable of being the anchor, instead they are the ones who need to be pulled back down sometimes. They are imaginative people who can find themselves lost in their own inner minds from time to time. Even though they might appear truly present in the room, ENFPs have minds which can often be far from reality. While they are capable of common sense in their own way, ENFPs simply have such rich inner minds that being practical seems a bit boring for them. Because of this they aren’t often seen as the anchors, but rather the ones in the clouds. INTJs might be imaginative people with rich inner minds, but they are also capable of being rather practical when need be. For the INTJ there are times when they can be so caught up in their own thoughts that they don’t much want to come down to reality, but that doesn’t mean they aren’t capable of it. For them it is more about exploring their minds because there is so much they want to figure out and sift through, and so this is best done by shutting out the world. INTJs are capable of bringing people back to reality when they are being unrealistic, but this is because they are logical and factual people. ENTJs are logical people and because of this they don’t like venturing off too far from reality. While they do have rich inner minds which can be rewarding and fulfilling places, they do want to be able to focus on getting things done. ENTJs value efficiency and so they don’t want to allow themselves to become distracted or have their head in the clouds. They can often be the anchor for people who appear lost and incapable of coming together, and so they do their best to be a good leader in this sense. INTPs can be truly imaginative people with rich inner minds, and so sometimes they are the ones with their heads in the clouds. While INTPs enjoy learning about new subjects and are highly analytical people, that doesn’t mean they are very grounded people. They often find themselves venturing down new paths in order to learn and dissect something completely new and even a bit unusual. INTPs aren’t afraid of diving into something that others might find a bit crazy or unrealistic, since they enjoy thinking outside of the box. These qualities often make them unique and intelligent people, but they aren’t often capable of being an anchor. ENTPs are imaginative people who enjoy exploring things which might seem odd and completely out of the box to others. Because of this desire to go down the path less travelled, ENTPs can often seem to have their heads in the clouds. They are rarely the anchors of their group, instead they might be the ones who need to be pulled down a bit. While ENTPs might sometimes seem to be venturing off in unusual directions, they don’t really want someone to hold them back from this exploration and curiosity which makes them who they are. ISTJs are practical people who focus on much more grounded things, and because of this they are definitely natural anchors. They are capable of pulling people down to earth when they seem a bit lost or distracted. ISTJs like to be focused on the things which are tangible and can actually be proven or changed. They simply want to be able to get things done without allowing distracted to keep them from doing what they need to do. ISTJs are very practical and down to earth and so they make for excellent anchors to their loved ones. ESTJs are definitely natural anchors since they are such grounded and practical people. They are definitely capable of bringing people back to reality when they seem to be lost with their heads in the clouds. While ESTJs appreciate imagination they still want to be able to get things done with a sense of focus and efficiency. Getting to caught up in their thoughts would lead them away from making sure their loved ones are properly cared for in a practical sense. ISFJs are caring but practical people, and so they are often the anchors for their loved ones. When someone needs to be brought down to earth a bit, the ISFJ is capable of being the person who help them. They believe in supporting those around them though and are willing to let their imagination run wild from time to time. They simply want to be sure that their loved ones are taking care of their practical and important responsibilities, without getting too lost in their own thoughts and desires. ESFJs are definitely down to earth people who are capable of being the anchor when they need to be. They are often the ones to remain grounded and focused on getting things done. ESFJs might make for good anchors but at the same time they want to let their loved ones feel free to be themselves. Sometimes they can be the only ones planted on the ground, while others seem to be lost with their heads in the clouds. ISTPs are definitely practical and logical people, which is often what helps them remain grounded in some ways. They are capable of bringing others back to reality when they seem to be a bit lost and distracted. For the ISTP being the anchor simply means giving people a dose of reality by using facts to really set them straight. They are focused on spreading the truth when they have the chance to do so, since ISTPs don’t enjoy seeing people share ignorance with those around them. ESTPs are practical people and so in some cases they are capable of being the anchor. They are very drawn to the real world around them and aren’t often the ones with their heads in the clouds. While ESTPs can sometimes be reckless people, this comes from their desire to experience new things and seek out excitement. This isn’t the same as being lost with their heads in the clouds, it simply comes from wanting to dive into things which are a bit intense. In truth ESTPs know when they are being reckless, they just don’t care to be controlled or held back. ISFPs aren’t likely to be good anchors, since they are often the ones pulled away by their own thoughts and imagination. ISFPs can become so caught up in the things that excite them that they lose sight of what is going on around them. ISFPs are imaginative people who enjoy exploring new things and don’t like to be held back by anyone. While they can be connected to the physical world, this is often in a much more passionate and dreamy manner. ESFPs aren’t often the anchors of their group, since they are the ones with their heads in the clouds. ESFPs are imaginative and passionate people who enjoy exploring new things and experiences. They can become so caught up in their own desires and excitement that they lose sight of reality a bit. ESFPs sometimes need a person to hold them back a bit and give them a stronger sense of reality. For the ESFP it just isn’t natural for them to be the anchor, they are more likely to be the wings dragging others away with them.